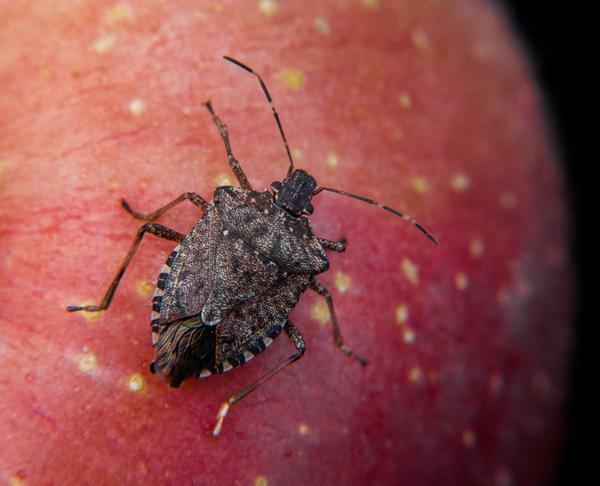 The brown marmorated stink bug (Halyomorpha halys; BMSB) is an invasive pest native to eastern Asia. 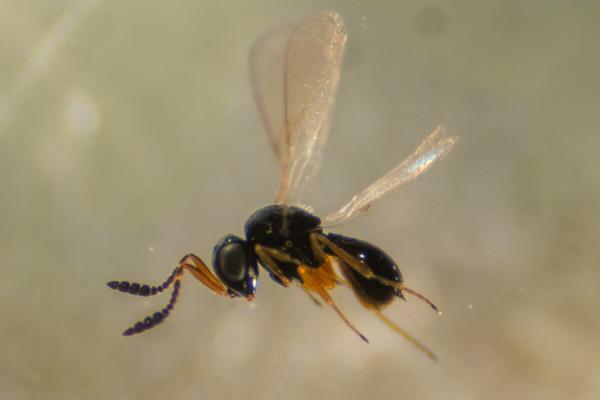 It was first detected in the United States in Pennsylvania in the late 1990s. Since then, BMSB has spread across the nation, increasing to large, damaging numbers throughout the mid-Atlantic region and beyond. It was first detected in North Carolina in 2009 near Winston-Salem. 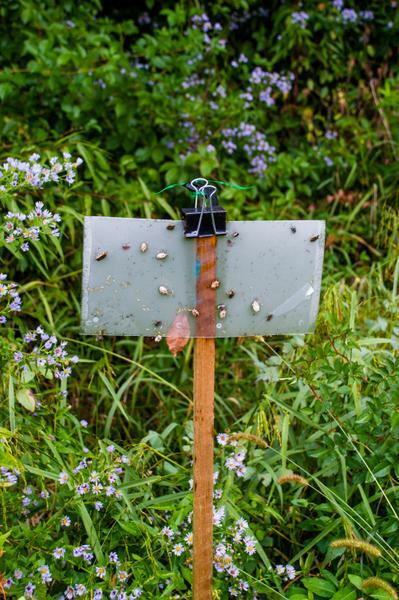 Initial invasions usually occur in urban or suburban settings, and BMSB had become a locally abundant nuisance pest in structures throughout the mountains and piedmont by 2012. 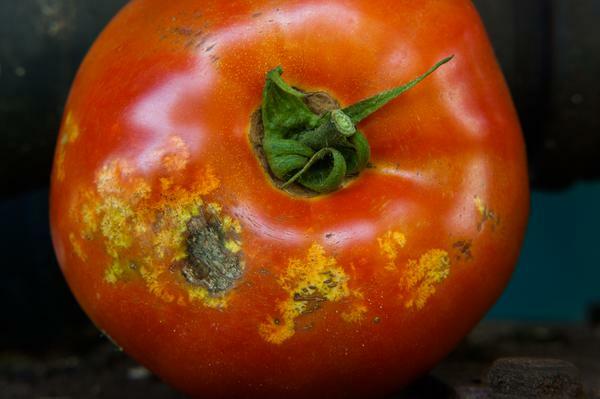 In some areas, home gardeners found destructive populations on tomatoes, peppers, okra, corn, and other host crops. By 2015, BMSB was causing significant damage in a variety of commercial crops. 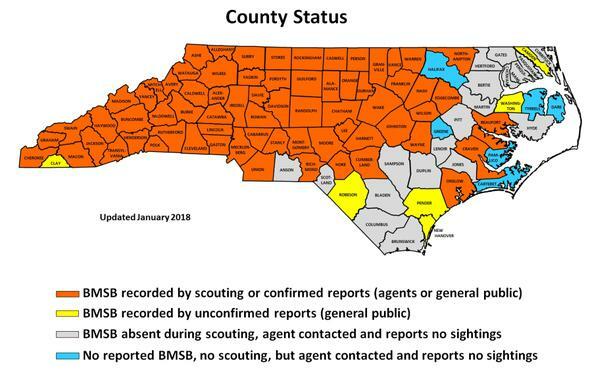 As of January 2018, BMSB was confirmed present in 70 of North Carolina’s 100 counties. For reasons that are not yet entirely clear, there have been very few reports of BMSB in the coastal plain. Some preferred wild hosts include (but are not limited to) tree-of-heaven, paulownia, catalpa, wild cherry, and black walnut. For the most current information on BMSB research in North Carolina, visit the BMSB in NC web page. BMSB is often confused with the native brown stink bug, dusky stink bug, rough stink bug, squash bug, and other hemipterans (see pictures of look-alikes here). However, it can be distinguished easily by whitish bands on the antennae and legs. Bands on antennae are apparent in both adult and immature forms. 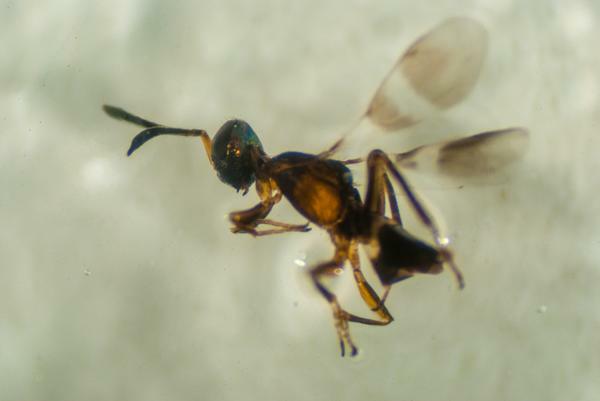 Mature adults are approximately 5/8 inch (17mm) long after progressing through 5 nymphal instars, which range from 1/10 to 1/2 inch (2.4 to 12mm) long. 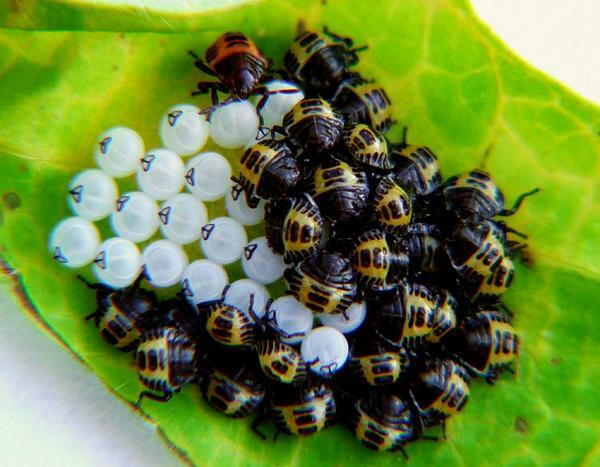 Eggs are each about 1/25 inch (1mm) in diameter (generally larger than those of native stink bugs) and are laid in masses that contain 28 eggs on average. 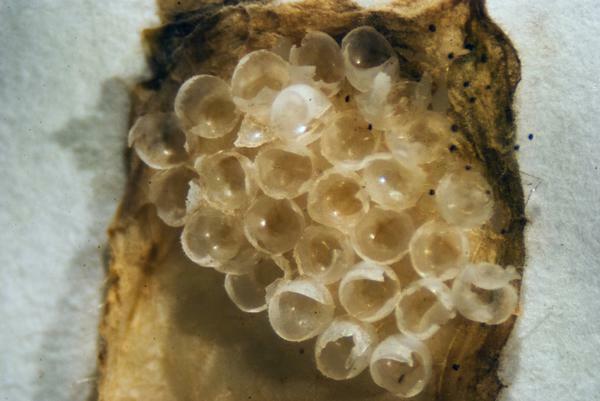 1st-instar BMSB nymphs hatching from egg mass. 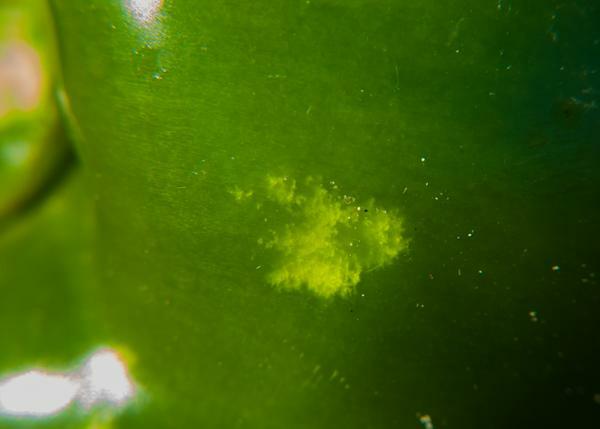 BMSB egg mass on a section of bean leaf. BMSB overwinter in dry, confined spaces. In nature, dead trees or fallen logs serve this purpose, but if homes and other buildings are available, BMSB will eagerly enter them, often aggregating in attics and other dark spots. 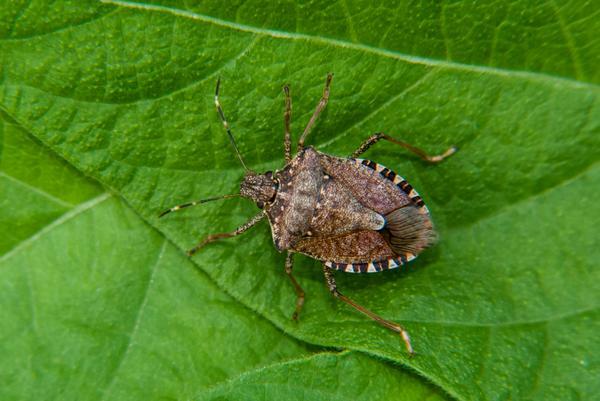 BMSB is the only stink bug species that seeks out human-made structures as overwintering sites. In April and May, adults emerge and move into wooded areas, where they feed and reproduce. In the early summer months, many adults and nymphs migrate to other habitats, including agricultural fields and home gardens. Both adults and juveniles will move among crops, and soybeans are among the preferred hosts late in the season. By mid-September, adults disperse to overwintering sites, and on sunny days are often observed aggregating on the outside of buildings. BMSB on corn, Lincoln County, North Carolina, late July. BMSB on peach in Henderson County, North Carolina, August. 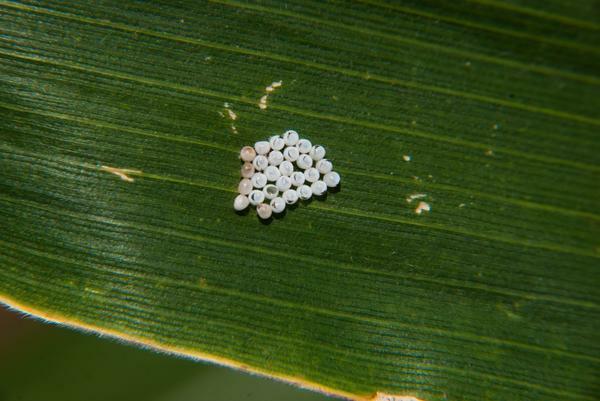 BMSB egg mass (hatched) on corn, Lincoln County, North Carolina, mid-August. 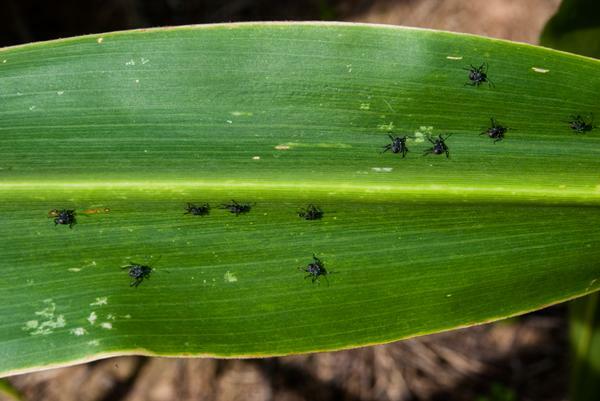 BMSB nymphs on corn, Lincoln County, NC, August. BMSB seeking entry into house near Statesville, North Carolina, early October. 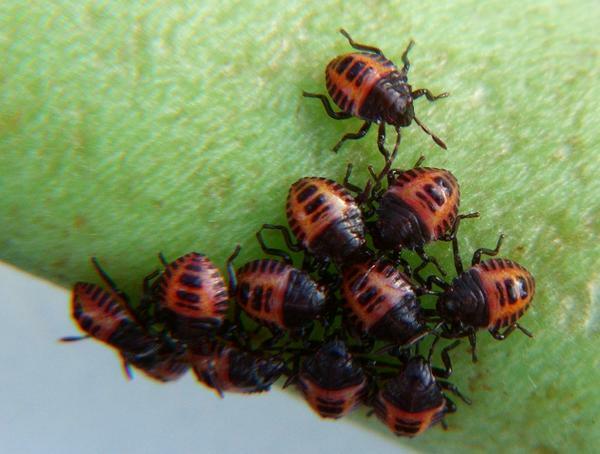 BMSB has a wide host range and potentially can become a major agricultural pest in many fruits, vegetables and row crops. 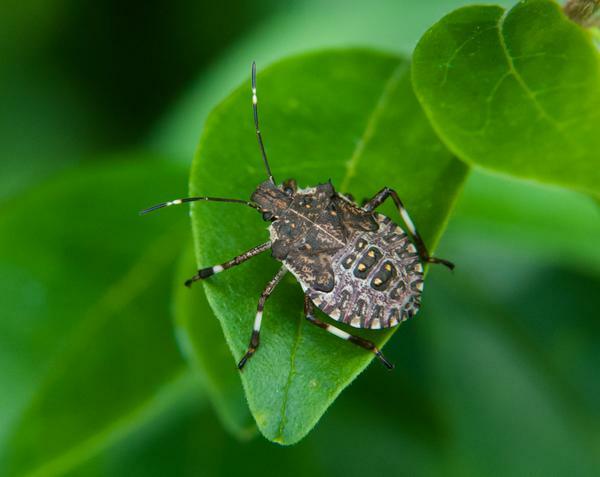 Like all stink bugs, they have piercing, sucking mouth parts, and in addition to removing plant cell contents while feeding, they secrete enzymes that kill tissue. 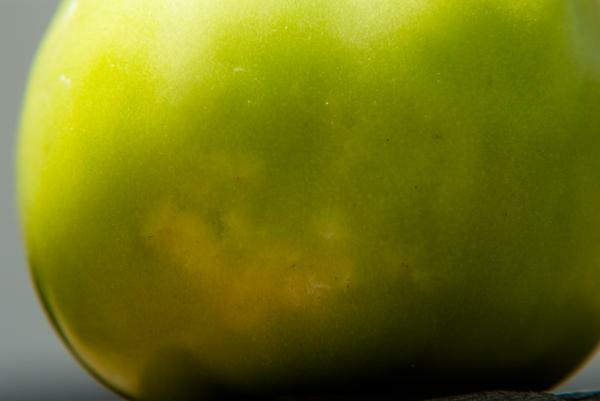 Damage has been most commonly observed on tomatoes, peppers, okra, apples, peaches, and corn, and is expressed as misshaped, discolored fruit. On some crops, such as peaches and corn, damage may not be apparent on the exterior of the fruit, and is only observed when the fruit is cut open. There is also evidence that BMSB can transmit microorganisms that cause some fruits, such as pepper and tomato, to rot. BMSB damage on apple exterior. 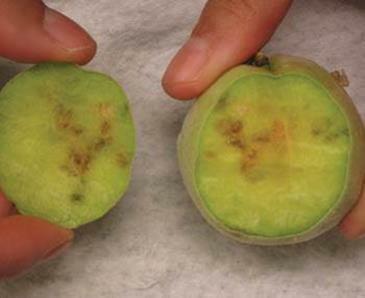 BMSB damage in apple cross-section. 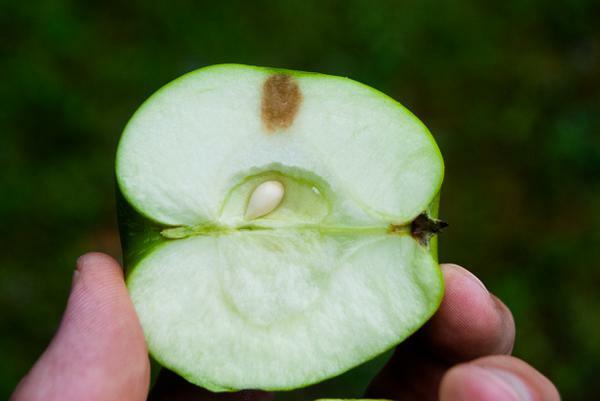 Apple slices with BMSB damage (left) versus corking (right). BMSB damage to peach interior, with no visible exterior damage. Stink bug damage on bell pepper. Stink bug damage on ripe tomato. 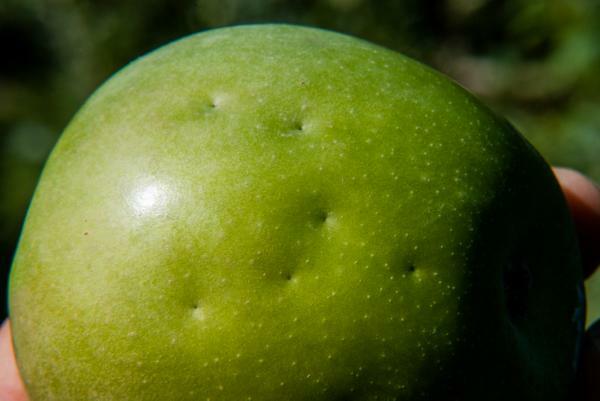 Stink bug damage on green tomato. 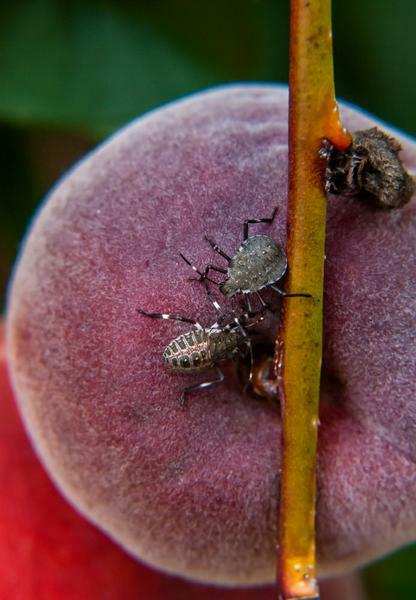 Insecticides are currently the most practical option for managing BMSB in agricultural and home garden settings. Insecticides belonging to the pyrethroid and neonicotinoid classes are most effective. 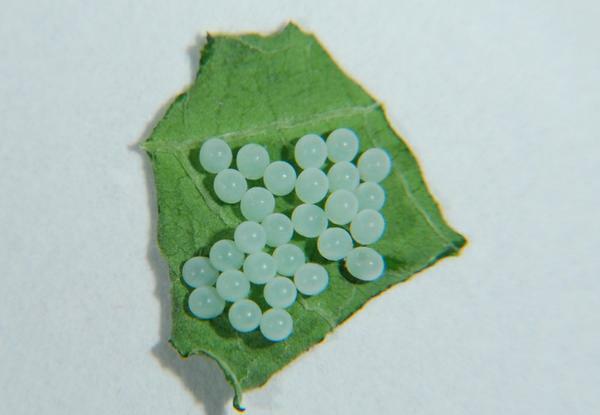 Naturally occurring biological control agents, primarily predators, can help to reduce populations, with BMSB eggs being the stage that is most vulnerable to biological control. 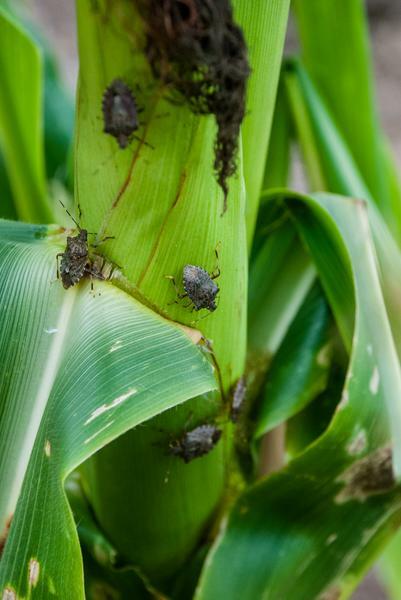 Research is being conducted to develop additional management strategies, including the use of trap crops, pheromones to attract and kill stink bugs, and other cultural management approaches. 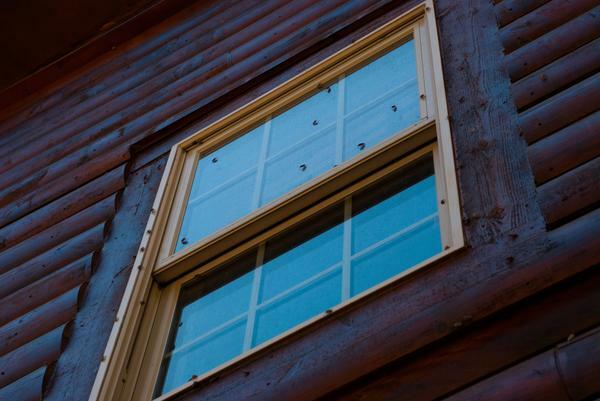 For more information on BMSB control, including tips for dealing with populations inside homes and other structures, visit the FAQ section of the BMSB in NC webpage. 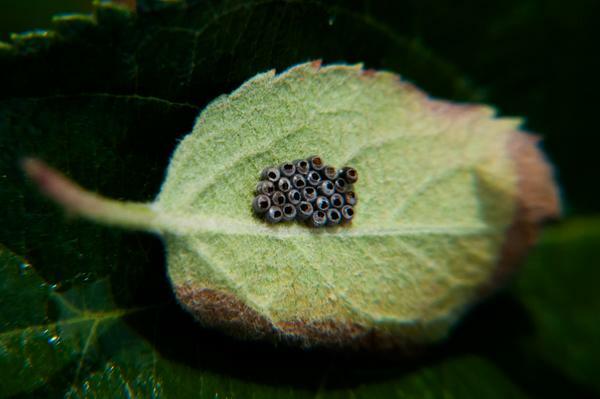 BMSB eggs eaten by predatory insects. Pheromone sticky trap to monitor BMSB presence on the edge of an apple orchard.